The new rule would force plenty of MLB pitchers to pick up the pace. After years of back-and-forth speculation, a pitch clock in baseball appears ready to become a reality — even though the players don't like it. According to Yahoo Sports, the new rule would give pitchers 20 seconds between deliveries whether there are runners on or not. If the pitcher is too slow, he'll get one warning. After that it's an automatic ball for the hitter. The rule might rub some fans the wrong way, but MLB Commissioner Rob Manfred has pushed for it for years now. It's part of a larger initiative of his to make games more watchable. "The reason we talk about pace of play is our focus is on eliminating the dead time and having as much action during the game as we possibly can have," Manfred said during an interview with Bloomberg in February 2017. Pitchers would certainly have to speed up under this rule. According to FanGraphs, there was an average of 23.8 seconds between MLB pitches last year — nearly four seconds more than what Manfred's new rule would require. Some pitchers would have it even tougher, like Yankees starter Sonny Gray. He took well over 27 seconds between pitches on average last year, but he'll have to keep it under 20 next season to avoid racking up penalties. 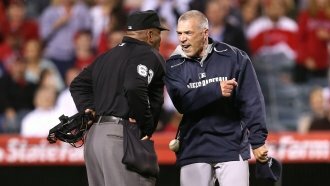 Related Story Are MLB Teams Too Quick To Change Managers? As you might expect, players aren't fans of a pitch clock, and reportedly plan to reject the league's proposal. But the league has given the players a year's notice, so it can change the rules whether the players like it or not.